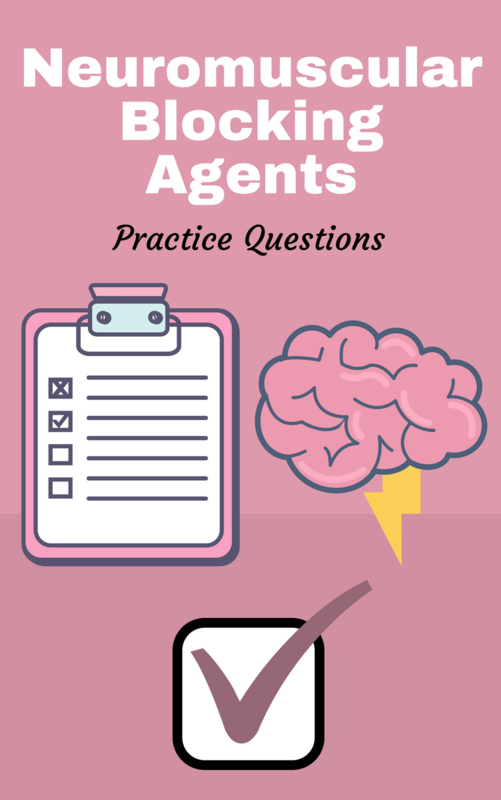 If you’re looking for a study guide loaded with practice questions all about Neuromuscular Blocking Agents then you’ve come to the right place. As a Respiratory Therapy student, you will be required to know all about the different Neuromuscular Blocking Agents in school. That is why we put this guide together for you to help you learn everything you need to know and more. So are you ready to get started? 1. What are two types of skeletal muscle relaxants? Neuromuscular blocking agents and spasmolytic drugs. 2. What is the major difference between the two types of blocking agents? Neuromuscular blocking agents act outside the CNS while spasmolytic drugs act primarily in the CNS and may be used to treat spasticity disorders caused by the CNS. 3. What is the mechanism of action for neuromuscular blocking agents? They interfere with neurotransmission at the neuromuscular junction, lack central nervous system activity, and primarily used as adjuncts in general anesthesia during surgery. 4. What do pre-ganglionic autonomic neurons and somatic neurons have in common? 5. Why does pancuronium have associated adverse effects on the ANS? Because of the similarity in neurotransmitter and associated nicotinic receptors. 6. What is the result of a prolonged occupation of a nicotinic receptor by an agonist and what is this called? Generates a depolarizing blockade, this persistent depolarization causes accommodation as a result of sodium inactivation gates remaining closed and thus muscle paralysis. Eventually the muscle repolarizes but is desensitized to the agonist. 7. What is a general characteristic of neuromuscular blocking agents? They are structural analogs of acetylcholine. 8. What are two types of neuromuscular blocking agents and their mechanism of action? Non-depolarizing agents: nicotinic receptor antagonists and depolarizing agents: nicotinic receptor agonist. 9. What are three indications for neuromuscular blocking agents? Muscle relaxation during surgery, endotracheal intubation, and electroconvulsive therapy. 10. What is another name for non-depolarizing agents? 11. What is the mechanism of action for non-depolarizing neuromuscular blockers? They bind to nicotinic receptors on motor end plates, inhibit Ach binding competitively, and preventing muscle membrane depolarization. 12. What is the non-depolarizing neuromuscular blocking agent sequence of paralysis? Small and rapidly moving muscles first: eyes and face; large muscles on limbs and trunk next; and, intercostal muscles and diaphragm last. Recovery occurs in reverse order. 13. What are three adverse effects of non-depolarizing neuromuscular blocking agents? Stimulation of histamine release, blockade of autonomic ganglia and vagolytic action. 14. What four non-depolarizing neuromuscular blocking agents cause histamine release and what are the effects and prevention? Tubocurarine, mivacurium, metocurine, and atracurium. Effects: hypotension and bronchospasm; Prevention: pre-medication with antihistamines. 15. What two non-depolarizing neuromuscular blocking agents blockade autonomic ganglia and what are the effects? Tubocurarine and metocurine with effects: hypotension and tachycardia. 16. What non-depolarizing neuromuscular blocking agents have a vagolytic action and what are the effects? Pancuronium and with effect of moderate tachycardia. 17. What are the pharmacokinetic characteristics of non-depolarizing neuromuscular blockers? Poor GI absorption, only administered IV, do not cross the BBB, eliminated in urine and bile as primarily unchanged compounds, some hepatic metabolites. 18. What non-depolarizing neuromuscular blocking agent undergoes spontaneous non-enzymatic degradation and is therefore is preferred for patients with liver and kidney impairment? 19. What interaction do non-depolarizing neuromuscular blockers experience with cholinesterase inhibitors (neostigmine, physostigmine, pyridostigmine) and why? Attenuate muscle relaxation, used to treat overdose of non-depolarizing blockers and used at the end of surgery to promote recovery. 20. What allows acetylcholine to out-compete the competitive inhibition? 21. What interaction do non-depolarizing neuromuscular blockers experience with inhaled anesthetics (isoflurane, halothane) and why? Potentiate muscle-relaxing effects because the dose must be reduced when used together. 22. What interaction do non-depolarizing neuromuscular blockers experience with aminoglycoside antibiotics (gentamicin, tobramycin)? Suppress ACh release from motor nerve terminal and potentiate muscle relaxation. 23. What interaction do non-depolarizing neuromuscular blockers experience with calcium channel blockers? 24. What are four considerations to the selection of non-depolarizing neuromuscular blocking agents? Duration of action, relative potency, onset time for muscle relaxation, drug-induced histamine release and cardiac effects. 25. What is the neuromuscular blocking classification of succinylcholine and its mechanism of action? Depolarizing neuromuscular blocking agent; binds to nicotinic receptors on motor end plate, depolarizing membrane; insensitive to AchE; and, prolonged depolarization causes muscle paralysis. 26. What is the sequence of paralysis for succinylcholine? Short-lasting contractions (fasciculation); small, rapidly moving muscles first: eyes, face; large muscles on limbs and trunk next; intercostal muscles and diaphragm last; and, recovery in reverse order. 27. What is the description of the structure, administration route, and duration of action for succinylcholine? Positively charged quaternary amine: orally ineffective; IV administration: usually IV infusion; and, short duration of action: 5 – 10 min. 28. What is the pathway of elimination for succinylcholine and factors that could affect metabolism? Hydrolyzed by the plasma cholinesterase, butyrylcholinesterase, with the level of cholinesterase effecting duration of action and certain genetic variants experience prolonged action of succinylcholine. 29. What are three potential major adverse effects of succinylcholine use? Hyperkalemia, malignant hyperthermia and post-op myalgia. 30. What four types of patients is succinylcholine contraindicated in? Burn patients, spinal cord injuries, muscular dystrophy and massive tissue injury. 31. What are some things that neuromuscular blocking agents are used for? Facilitate intubation, surgery, enhance vent synchrony, reduces ICP, reduce O2 consumption, keep patients immobile and terminate tetanus and status epilepticus. 32. What neurotransmitter is responsible for nerve conduction in skeletal muscle? 33. What is happening during depolarization? 34. What is happening during repolarization? Membrane potential returning to baseline (relaxation). 35. What are the two ways to block a muscle contraction? Competitive inhibition, prolonged occupation and persistent binding. 36. What agents are used for competitive inhibition? 37. What agents are used for prolonged occupation and persistent binding? 38. How do non-depolarizing agents work? By blocking acetylcholine receptors located on the muscles without activating them; and, by blocking the receptors, naturally occurring Acetylcholine that is released by the axon, cannot be received by their receptor sites on the muscles. 39. What must non-depolarizing resemble in order to be able to bind to the Acetylcholine receptors on the muscles? 40. How must non-depolarizing agents be administered and why? Through IV because they are poorly absorbed into the GI tract. 41. What are the three categories of skeletal muscle relaxants? Neuromuscular blocking agents, centrally acting, and peripherally acting muscle relaxants. 42. How do neuromuscular blockers cause muscle relaxation? Interfere with transmission at the neuromuscular end plate. 43. What are the characteristics of neuromuscular blockers? They are highly polar and not absorbed orally and do not cross the blood/brain barrier. Animal’s fully conscious but paralyzed. 44. How are neuromuscular blockers administered? 45. What are the two pharmacological categories of neuromuscular blockers? Competitive antagonists of acetylcholine at the NMJ (non-depolarizing agents) like tubocurarine; and, depolarizing agonists that produce a polarizing block at the NMJ (succinylcholine). 46. What are the depolarizing neuromuscular blockers? 47. What are the long-acting non-depolarizing neuromuscular blockers? 48. What are the intermediate acting non-depolarizing neuromuscular? 49. What are the pharmacological actions of neuromuscular blocks? Fairly sensitive action at NMJ to block Ach neurotransmission and produce paralysis, histamine release. 50. With what condition is neuromuscular blocking agents used with extreme caution, if at all? 51. What does histamine release cause? Flushing, hypotension, excessive bronchial and salivary secretions and bronchospasms. Can be blocked by pretreatment with antihistamines but not atropine or neostigmine. 52. What are the adverse effects of neuromuscular blockers? Hypotension (histamine release), bronchospasms and excessive secretions, and respiratory failure. 53. What are the drug interactions when giving neuromuscular blocking agents? General anesthetics act synergistically with competitive blocking agent; Quinidine, lidocaine, and other local anesthetics and antiarrhythmic; Aminoglycoside antibiotics (gentamicin, neomycin, kanamycin, etc.) bacitracin, lincomycin, clindamycin; and, calcium channel blockers, furosemide and magnesium. 54. What are the clinical uses of neuromuscular blocker? Adjunct to surgical anesthesia to induce skeletal muscle relaxation and facilitate manipulations during surgery, orthopedic procedures, facilitate intubation with an endotracheal tube, to decrease the intensity of muscle contraction in electroshock therapy. 55. What are the non-depolarizing neuromuscular blockers? Vecuronium bromide, pancuronium bromide, and benzylisoquinoline. 56. What is a depolarizing (noncompetitive) blocking agent? 57. What is the mechanism of action of succinylcholine? Depolarization of motor end plate-like Ach which produces transient muscle activation. 58. What does persistent depolarization of succinylcholine cause? Blocks neuromuscular transmission by not allowing the sub-synaptic membrane to repolarize. 59. What do all neuromuscular blocking agents not have? All neuromuscular blocking agents have no analgesic/sedative or anesthetic actions. 60. From what do interactions with succinylcholine caused from? Carbamates, organophosphates, and other cholinesterase inhibitors. 61. What is an example of a tranquilizer that could be hazardous to use with succinylcholine? Phenothiazine because they have some anticholinesterase activity. 62. What prolongs the action of succinylcholine? Conditions that elevate plasma potassium concentration (burns, tetanus, trauma). 63. What are the clinical uses of neuromuscular blocking agents? Relaxation of skeletal muscle pre-surgery, relieve muscle spasms in convulsive states like tetanus, prevent dislocations and fractures during electroconvulsive shock and as a “provocative test” in the diagnosis of myasthenia gravis. 64. What is the brief duration of succinylcholine due to? Rapid hydrolysis by cholinesterase enzyme of the liver and plasma. 65. What may cause prolonged depolarization from succinylcholine? Muscle cells to lose significant potassium resulting in elevated serum potassium concentrations and should not be used in animals with hyperkalemia. 66. What are the cardiovascular effects of succinylcholine? All cholinoreceptors including nicotinic receptors in SNS, PNS, the adrenal medulla, and muscarinic in the heart. Low doses: bradycardia (blocked by atropine); large doses: hypertension and tachycardia associated with stimulation of sympathetic ganglia and adrenal medulla. 67. In what condition is succinylcholine contraindicated? Glaucoma since intraocular pressure can increase and intracranial pressures increase as well. 68. What is malignant hyperthermia? Can be side effect of succinylcholine: rigidity of muscles, elevated temperature and increased metabolism. 69. What are the clinical uses for succinylcholine? Drug of choice for endoscopy, terminating laryngospasm, endotracheal intubation, and orthopedic procedures. 70. What can be said about the potency of succinylcholine? Varies in different species. Bovine and canine very sensitive. 71. What is important about succinylcholine preparations? Should always be refrigerated since it is rapidly hydrolyzed. 72. What do neuromuscular blocking agents NOT do? They do NOT cause sedation and they do NOT relieve pain. The most commonly used depolarizing drug. 74. What are non-depolarizing neuromuscular blocking agents? Prevent ACh from acting at NMJ and skeletal muscle does not contract. 75. What is an adverse effect of non-depolarizing neuromuscular blocking agents? 76. What is the neuromuscular blocking agent therapeutic use? They promote skeletal muscle relaxation and aid in facilitating endotracheal intubation. 77. What is the most common adverse effect of neuromuscular blocking agents? Hypotension due to release of histamine. 78. What is the pediatric succinylcholine dosage range? 79. What is the adult succinylcholine dosage range? 80. What are the succinylcholine side effects? Hypokalemia and increased intraocular pressure. 81. What are the steps that lead to neuromuscular transmission? Nerve stimulation; action potential; ach release; activation of nicotinic receptors on post junctional membrane; opening of ion channel of nicotinic receptor; and depolarization at end plate potential in muscle. 82. Why is desensitization important? Nicotinic receptors desensitize when in the continued presence of Ach or other nicotinic agents. When desensitized the receptor adopts a conformational change to a non-conducting state. The receptor cannot be reactivated until the agonist unbinds and the receptor returns to its resting state. 83. What is the mechanism of action of competitive neuromuscular blocking agents? Agents combine with nicotinic receptors on post-junctional membrane thereby blocking the access of Ach at these sites. 84. How can the effect of competitive neuromuscular blockers be overcome? By increasing the amount of ach at the NMJ and anticholinesterase drugs such as neostigmine can reverse the effects of “competitive” blockers. 85. Why are neuromuscular blocking agents dangerous for patients with myasthenia gravis? Because if you give someone a neuromuscular blocker who hardly has nicotinic receptors you will make their condition much worse. They would be much more sensitive to neuromuscular blockers. 86. What is the mechanism of action of depolarizing neuromuscular blockers? Agents activate nicotinic receptors and depolarize the post-junctional membrane in the same manner as Ach but more persistently. 87. What effect do anticholinesterase drugs have on depolarizing neuromuscular blockers? They do not reverse the process but by increasing levels of ach at the NMJ these drugs may enhance the blockade. 88. What type of drug is succinylcholine? So there you have it. Thank you for much for making it to this very end of our study guide about Neuromuscular Blocking Agents. I truly hope that these practice questions were beneficial for you. I feel good about the fact that if you go through this information enough times, the information will stick and your Pharmacology knowledge will boost to the next level. Thanks for reading and as always, breathe easy my friend.